While it's clear that a lot of people believe in God, whether they should is a matter of loud debate. Since the Enlightenment, and especially in the last 150 years, a consensus has been building in Western philosophy that belief in a transcendent order—and especially in a supreme being—is unreasonable and should be abandoned. The result of this trend has been to delegitimize religious belief, to claim that those who believe do so against scientific evidence and rational thought. In this confident and sensitive book, William Greenway carefully guides the reader through the developments in Western intellectual life that have led us to assume that belief is irrational. He starts by demonstrating that, along with belief in God, modern definitions of human rationality have also rejected free will and moral agency. He then questions the Cartesian assumption that it is our ability to think that makes us most human and most real. Instead, Greenway explains, it is our capacity to be grasped by the lives and needs of others that forms the heart of who we are. From that vantage point we can see that faith is not a choice we make in spite of evidence to the contrary; it is, rather, wholly rational and in keeping with that which makes us most human. Every person who either has faith or is contemplating faith can be assured that belief in God is both reasonable and good. Greenway embraces both contemporary philosophy and science, inviting readers into a more confident experience of their faith. 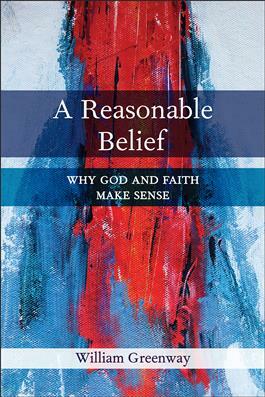 "In A Reasonable Belief: Why God and Faith Make Sense, William Greenway offers an apology for the reasonableness of Christian faith against its secular cultured detractors, from early modern philosophy to the late twentieth century. The author creatively illustrates how spiritual realities feed back into the substantive beliefs and sources of Christian faith through expositions of scripture and doctrine, especially the parables and life of Jesus, which are based on his insightful reading of Levinas. Surprisingly, what begins as a strictly philosophical defense of Christian faith, movingly invites patient readers to travel from the languages of apology, evidences, and warrants to languages of the spiritual sphere where Christians and non-Christians alike may reasonably affirm that 'God is Love and love is God.' Greenway offers an insightful, constructive, and passionate journey into such a faith." "With calm clarity, Bill Greenway invites us to think anew about the utterly reasonable character of Christian faith. After tracing the historical shifts that led to our modern secular condition, with its assumption that 'faith' is opposed to 'reason' and 'nature' to 'spirit,' Greenway argues that these dichotomies are inadequate. Instead, he draws from the theological turn in modern philosophy, especially the thought of Levinas and Marion, to show the necessity of another account to attend to the full range of human existence, including horrific evil and forgiveness. In the end, his call for 'reasonable belief' is actually a call to surrender ourselves to Love." "Through a clear, concise, and compelling analysis of the `secular condition,' Greenway embraces the discoveries of modern science while offering a forceful challenge to purely naturalistic accounts of reality. By arguing that multiple descriptive vocabularies are necessary to do justice to the full range of human experience, he steers artfully between the Scylla of substance dualism and the Charybdis of monist materialism. And his analysis of agape as the love that seizes us apart from any decision we can make gives eloquent testimony to his central claim: `Faith in God is reasonable, but faith in God is not the conclusion of an argument.'"